One question that has dogged me during my time with BioWare's Anthem is: why do the Javelins, the game's snazzy flying exoskeletons, have to look like human beings? In a world where science is sorcery, why replicate our shopworn bipedal anatomy when we might zip about looking like, say, robot tarantulas or lions? There are many down-to-earth explanations for this, of course—spiders and lions are, I'm guessing, harder to motion-capture than other humans, and besides, who could say no to another BioWare game's worth of perky cyborg bottoms. But the odder prospect I want to dig into today is that Anthem's Javelins need to look human because Anthem is part of a long, and perhaps regressive tradition of stories about protecting the concept of the human from change in a changeable world. And to do that, I need to talk a little about the work of Donna Haraway. Haraway is a social scientist who, amongst other things, explores how artists might respond to today's on-going ecological catastrophes. In the accessibly titled Staying with the Trouble: Making Kin in the Chthulucene, she suggests that our trashing of the environment is dependent on the view that worlds consist of "preexisting bounded units", of wholly separate individuals and species. This outlook owes something, Haraway goes on, to the rationalisations offered for European empires, but even without any open aim to conquer, dividing up existence so absolutely creates a basis for confrontation and exploitation. Against this, she pitches a philosophy of "becoming with", in which creatures aren't merely dependent on but actively shaped by each other. It's not just that, say, human society would collapse without insects to pollinate crops—how we define "human" arises partly from how we define insects. Elsewhere, Haraway has pointed to cyborgs as metaphors for this profound interdependence: they are fusions of flesh and machine that put all kinds of long-accepted distinction under stress. In the course of her book, Haraway takes a few swipes at kinds of art that adhere to the notion of "preexisting bounded units". She's especially critical of the heroic fantasy, beloved of videogames, summarising it as "a tragic story" in which all things beside the hero are just "props, ground, plot space, or prey". This kind of art, she suggests, draws a hard line between the human as protagonist and other creatures, defining the latter as inert and without capacity to act on the human in turn. Haraway is not, to my knowledge, a videogame player (though she does explore other kinds of game, such as Navajo string figure-making) but this account certainly says something about an open worlder like Anthem, in which human warriors wrapped in motorised plate carve a swathe across a passive, nonhuman environment that exists to be converted into resources. I think there are aspects of Anthem that tug against this premise, however, and curiously enough, the Javelins are at the heart of that. On the one hand, they are the part of the game that most obviously mark the humans out as separate entities, shielding them from the environment's effects: you have to squeeze into one just to access the verdant landscape beyond the walls of Fort Tarsis. On the other, there are elements of how Javelins work that build on a strain of eco-commentary in the game's writing, and which make manifest a kind of "interdependence" Haraway would possibly consider intriguing. The glossy solidity of the Javelins is a firm contrast to the creeping chaos of Anthem's setting. Though outwardly a sedate, scenic expanse of dungeons and collectibles, bristling with the wreckage of yet another long-gone civilisation, the planet is represented to you as a place where the bones of reality are crumbling. Its crevices are packed with "Shaper" artefacts that have the power to rewrite the laws of physics and transform any organisms foolish enough to lay hands on them. As in much "new weird" sci-fi these relics serve as metaphors for more mundane biological processes of growth, decay and transformation. They are a dramatisation of the "natural" world's capacity to burst through the barriers thrown up by society, including the conceptual boundaries between individuals and species. One Shaper relic you encounter performs a bizarre act of triplication, scattering a major character's personality traits across three bodies. You're told of another relic that performs the same action in reverse, blurring three lumbering Titans into one. Other aspects of the background writing continue the theme of combination, mutation and transformation. Among your most frequent opponents, for instance, are the Scars, insect swarms that have learned to congeal into humanoid form, much as army ants arrange themselves into nests and bridges. 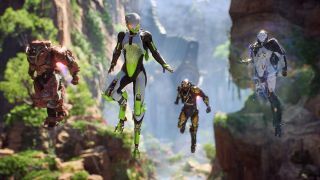 In terms of the plot and your mission objectives, of course, Anthem has no real interest in being some kind of grand ecological thought experiment. For all the talk of ripping the fabric of spacetime, the Shaper relics serve mostly as outlandish timebombs or spawning huts in a game that regards anything not your character as fodder for earning mechanisms. The writing, however, remains committed to the idea that the player's bodily identity is under threat of invasion and transformation by an environment saturated with wayward creative forces. Your larger-than-life humanoid suit is as much protection against such unsettling notions as it is protection against globs of acid or bolts of lightning. It is a toughening and brightening of anatomical contours that Bastion itself, with its strange anthropomorphic insects and shape-shifting artefacts, threatens to smear beyond recognition. You can see this defensiveness, I think, in the over-compensatory theatrics with which Javelins fall to earth, smacking down without harm to the player no matter the drop. However hard you collide with this world, you will always emerge unaltered. Indeed, exactly how worn and torn your Javelin appears is strictly a question of cosmetic preference. If Anthem therefore seems yet another fantasy, in Haraway's argument, which seals humans off from the world for the sake of defeating and exploiting it, there are aspects of the Javelin's design that evoke her concept of "becoming with" other creatures and one's surroundings. For one thing, there's the elementary fact that wearing a Javelin makes you a cyborg. Every time you put the suit on, you're muddying the distinction between human and robot. I highly doubt it was the aim, but I think this muddying is nicely captured by the transition cinematic itself, which is curiously backwards in its staging. You force your avatar's body into the padded interior—and are simultaneously ejected from that body into third-person view. You are excluded from your character's flesh, in other words, as it becomes the cybernetic organism it needs to be in order to interact with Bastion's environment. It registers a kind of unease about what humans might have to give up if they want to be part of this world. This collapsing-together of categories is played out further in the game's handling of temperature, which trades on the idea that you and the environment have a symbiotic rapport. One of Anthem's neater gimmicks is that flying your Javelin generates heat, your suit thrusters glowing red and whistling like a kettle if you boost for too long. Max the bar out and you'll trigger a system reboot, crashing to earth and remaining grounded for a few seconds, but in a quietly fascinating touch, you can cool off mid-flight by working with the terrain. Stoop to increase the air speed around your suit and you'll slow the filling of the bar. Slip briefly behind a waterfall as you round a cliff and you'll reset it. Rain is a blessing indeed, allowing you to blast about at whim, but most pleasing of all is the act of following the water through the world—skimming a lake like Peter Pan admiring his reflection, or keeping a river company along a canyon floor. It fosters a more intimate, playful understanding of Bastion's landscape than memorising the points on the map where resources, quests and foes typically cluster, though such considerations remain uppermost in your mind. And it transforms your Javelin, that sealed and cushioned metaphor for the human being's aloofness, into a kind of animal, reliant on its habitat for movement—a hot-blooded cyborg predator that has developed clever ways of staying cool during the exertions of the chase. You can imagine Javelins jousting for territory, spilling each other's circuits for possession of lagoons near Ursix spawns, or migrating along river channels. You might even start to wonder how they'd deal with seasonal change or—not to be too on-the-nose in my reading—some broader climate crisis. Would the Javelins rule the skies on a hotter, flatter planet? Or would they be prey? Absurd though all this may sound, the plain truth of any game like Anthem is that it is a designer's exploration of "species relations", of how player, non-player characters and environment make each other what they are. Bastion's waterways are, of course, not actually the result of aeons of precipitation and erosion. They are tightly designed around your capabilities, and your capabilities in turn are tightly designed around them—and all of this will continue to evolve, as BioWare tinkers with a service game that is (theoretically) designed to absorb hundreds of hours of your time. Think about the game this way, and the harsh divide between humans and world implied by the Javelin starts to ring a little hollow. It suggests an idea of the open world action game, and of our relationship with the world in general, that has a future, where the relentless exploitation of landscapes and creatures can only bring about our destruction.